Nagaland Chief Minister Neiphiu Rio on Saturday reiterated Prime Minister Narendra Modi’s commitment to accord special privilege to the Nagas of Eastern Nagaland. Modi during a Nagaland Assembly election rally in Tuensang, which falls in Eastern Nagaland, on February 23, said the government would ensure special focus to develop the backward Eastern Nagaland. The people of Eastern Nagaland have been demanding creation of a separate state of Eastern Nagaland. Keeping in mind the PM’s assurances, Rio appealed to the people to give their mandate to the People’s Democratic Alliance (PDA) consensus candidate Tokheho Yepthomi in the May 28 Lok Sabha bypoll to represent them at the Centre. On his part, the chief minister assured that the PDA government will uplift the Eastern Naga areas. Rio was addressing a bylection rally in Mon town council hall. He alleged the greed and selfishness of the leadership of previous state government led by now Opposition Naga People’s Front (NPF) had hurt the sentiments of Nagas greatly. Stating that NPF president Dr Shürhozelie Liezietsu was not the founder of the party, he urged upon the people not to be misled by the NPF’s propaganda but to know the truth about the genesis and history of the party. PDA candidate Yepthomi accused the NPF of adopting double standards. He pointed out that the NPF is still a part and parcel of the BJP-led government in Manipur but in Nagaland they have been portraying the BJP as communal and anti-Christian in their speeches and statements. He alleged that BJP has been ignoring leader of Opposition and former chief minister TR Zeliang for his “corrupt nature”. On the other hand, he compared Rio’s leadership and capability to that of a gigantic tree. “Rio is the only leader who can give shade and shelter to the Naga people,” he stated. The NPF has fielded former parliamentary secretary C. Apon Jamir against Yepthomi. 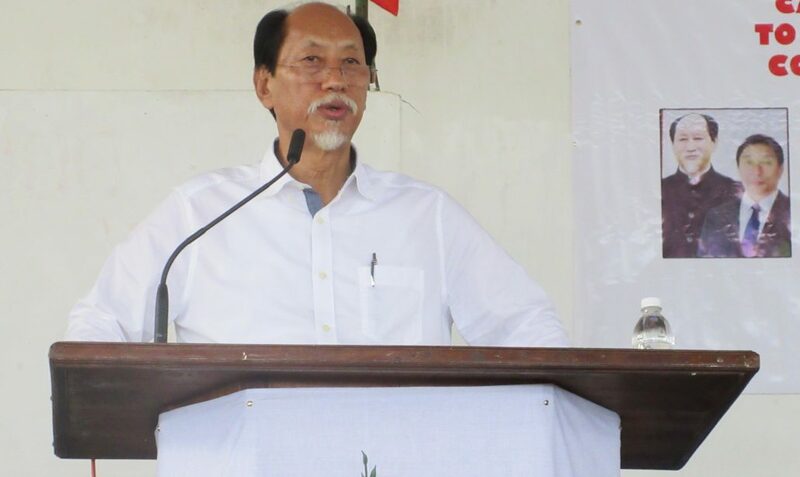 Yepthomi said with the blessings and guidance of veteran leader and Nationalist Democratic Progressive Party (NDPP) president Chingwang Konyak, state BJP president Visasolie Lhoungu and other PDA alliance partners, the JD (U), the National People’s Party (NPP) and the lone Independent legislator, he has high hopes of a win and appealed to the people to vote for a progressive Nagaland. Expressing discontentment at Zeliang and Shürhozelie’s leadership, NDPP president Konyak said both have failed the Nagas because of their lack honesty and sincerity.